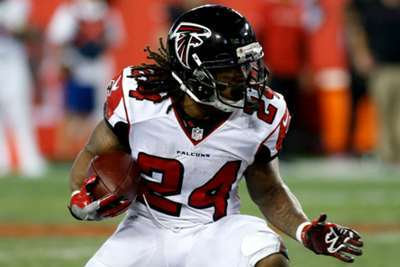 The ailing Atlanta Falcons have lost another starter for an extended period of time after placing Devonta Freeman on injured reserve. Running back Freeman is scheduled to have surgery on a groin injury, though it is hoped he may yet play again before the end of the regular season. The 26-year-old was also hampered by knee and foot injuries, forcing him to sit out four games. "Following the game against Pittsburgh, where Devonta injured his foot, we thought he was just having general soreness in his groin area," Falcons coach Dan Quinn said. "As the week went on it continued, so we decided to have him get some tests. It has been determined that he will need a procedure that will result in us placing him on injured reserve. "We are hopeful he will be able to return this season, but we will have a better feel for that in the coming weeks." Tevin Coleman will continue as the team's starter in Freeman's absence, backed up by rookie Ito Smith. The loss of Freeman - who signed a new five-year contract in August 2017 - is the latest setback for the Falcons, who had already lost Deion Jones, Keanu Neal and Ricardo Allen to long-term injuries. Kicker Matt Bryant will also miss Monday's game against the New York Giants because of a hamstring issue, forcing Atlanta to look for a replacement. Giorgio Tavecchio, who spent time with the team in the preseason, was signed on Tuesday to fill the void, securing a return to the NFL after playing in all 16 games for the Oakland Raiders in the previous campaign.